Although San Diego is only home to 1 percent of the nation’s privately-owned businesses, it is home to more than 2 percent of the Inc 5000 list. In 2013, 101 companies made the Inc. 5000 ranks. 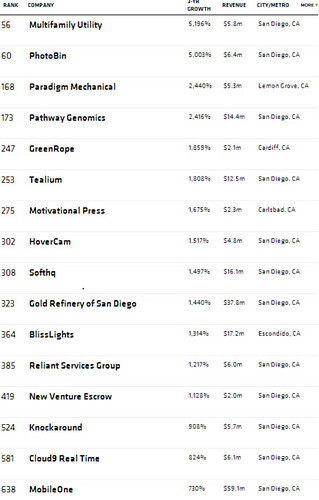 According the 2014 data, 113 companies throughout San Diego County are now considered the fastest growing companies in the U.S.
EDC investors VAVi Sport & Social Club, Sentek Global, D&K Engineering, SKLZ and Stone Brewing Co. all made the ranks. Other familiar names, such as TakeLessons and Underground Elephant, were also mentioned on the list. Businesses on the list are ranked according to their past three years of revenue growth. Inherently, the list methodology recognizes many small and medium-sized companies, as they often see large revenue percentage growths in their first few years. From 2010-2013, the number of startups on the list grew by 310 percent. San Diego’s story is consistent with many of the overall national trends. As an economy made up of small and medium-sized businesses, San Diego has seen tremendous growth and innovation from its startup and tech community. Although many of our recent rankings just look at one factor or sector of our economy, the theme remains: Whether it's tech, lifestyle or culture, San Diego – and its economy – continues to shine. You can view the complete San Diego list here.